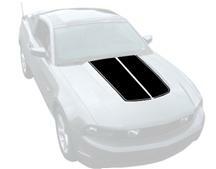 Add a custom look to your Mustang with 2010-2014 Mustang hood decals and stripes from Late Model Restoration. Choose from S197 Mustang hood racing stripes and hood hash marks to get show winning looks. These decals are custom fit for 2010, 2011, 2012, 2013, and 2014 Mustangs. Show off your Mustang pride with 10-14 Mustang hood hash decals and hood stripe kits form Latemodel Restoration. These decals are the perfect way to get your 2010-2014 Mustang standing out from the crowd.